This is not the product of radical feminist ratbaggery, but a clear reasoned approach permeated with scripture and written from a conservative evangelical standpoint. Mrs. Hull is the daughter of the late Frank Gaebelein, a well-known evangelical theologian, is married to a practicing attorney and is the mother of three married children. She is also a Bible teacher and an elder in the Presbyterian Church (USA). The first part of the book is biographical. She describes her family and upbringing, her conversion and her struggle to reconcile the rigid and androcentric teaching of the church with her expanding knowledge of the scriptures and her desire for meaningful service. She argues that men and women are equally portrayed in the scriptures as ambassadors for Christ. She is at pains to emphasize the importance of the part played by women as administrators and teachers in both the Old and New Testaments. The writer comes down quite heavily on certain undesirable traits in some of our male Old Testament heroes. Mrs. Hull is against both male and female roles which are too rigid. Marriage is an equal partnership, so is ministry and ambassadorship. What is vital is that both men and women are in subjection to Christ rather than each other. The book closes with three appendices. The first is a tongue-in-cheek argument for female supremacy, using biblical passages, by Alvera Mickelsen. It is a clever satirical attempt to show how scripture can be misused. The second appendix is a summary of exegetical difficulties in the "Hard Passages" of scripture by Sanford Douglas Hull, her son. It reveals a great variety of interpretations concerning the passages, I Corinthians ll:2-16, I Corinthians 14:33b-36 and I Timothy 2:8-15. Appendix 3 by Catherine Clark Kroeger examines the classical concept of Head and "source". 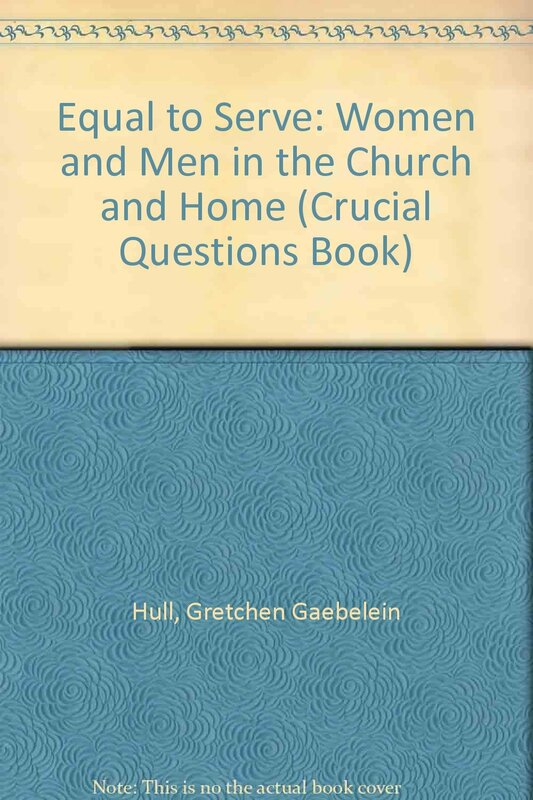 Not everyone will agree with this book, but it is a well-written and thorough examination of the relationship of men and women and God as seen in the scriptures against the background of the contemporary church. As the dust cover says, Equal to Serve is a call to Christian men and women to yield their right . . . their thought . . . their lives in totality to serving Jesus Christ." Rev. Philip C. Blake is the Director of Chaplaincy, Sydney Home Mission Society.